NEW YORK CITY — Organizing for Action, the advocacy group that evolved from President Barack Obama’s reelection campaign, will halt its single-issue fundraising during the 2014 midterm elections in order to free up resources for the "campaign side," the group’s executive director Jon Carson told a small group of donors at a fundraiser here Monday night. Democrats have expressed concern that OFA could siphon resources away from the Democratic National Committee and other campaign activities during an election year. "At the appropriate point, in 2014, you will stop seeing email ‘asks’ from us around a given issue, and the campaign side will take over," Carson told a crowd of around 40 attendees. "Now, as a nonprofit, non-electoral organization, we won’t ever send out an email saying, ‘Now go work for candidate such-and-such.’ But here’s the thing, we’re going to organize people around these issues, and one of two things is gonna happen. Either Republicans like Jeff Flake and others are gonna realize they better start voting the right way, or I think we’re going to have a pretty energized army of people ready to go over to that electoral side. So that’s how we see that happening in 2014." Obama said at an OFA fundraiser in March that the group was not just "a mechanism to try to win the next election in 2014." "What we've tried to explain to people is, is that, no, I actually just want to govern—at least for a couple of years," Obama said. A Washington Free Beacon reporter paid the $25 minimum entry fee to attend Monday’s fundraiser. OFA has fewer fundraising restrictions than campaign committees due to its 501(c)(4) nonprofit status. The group has vowed it will not accept money from lobbyists or corporations. However, it has courted donations from "industry leaders" in exchange for seats on its board of directors. It also accepts contributions from labor groups. Carson confirmed the group has reached out to wealthy businessmen such as Microsoft founder Bill Gates. "The [news reports] about the industry leaders, what that was talking about was folks like Bill Gates and others, who are going to be on our advisory boards, give us advice on outreach and lessons that they’ve learned," Carson said. "In Bill Gates’ example, from the successful nonprofit work he’s done." A dark money network of wealthy liberal donors known as the Democracy Alliance also selected OFA as one of the groups it will steer money to in 2013, the Los Angeles Times reported last week. When asked why OFA was comfortable accepting money from individual corporate donors but not corporate lobbyists, Carson said the group has been transparent with its fundraising information. "We’re gonna publish every single donation we get over $250, and you will find nowhere on that list any executive from Walmart, so far as I’m aware right now," Carson said. While OFA says it voluntarily discloses all of its donors who give $250 or more, watchdog groups say the disclosure is not verifiable. Watchdogs have also criticized OFA for not reporting its donors’ employment information, making it difficult to track whether corporations are "bundling" donations through multiple employees. "That’s a major deficit in the disclosure," Public Citizen’s Craig Holman told the Free Beacon last month. "If we don’t know who [donors are] working for it makes it very difficult to try to determine if there is a great deal of bundling activity going on supporting this electioneering nonprofit group. … We haven’t got a clue if they come from Boeing if they come from what company and what they want in return." "When we put out our last [disclosure] report, I don’t think anybody had any trouble figuring out who the folks were who were giving us larger contributions," he said. Carson said OFA would not consider releasing employer information about its donors in the future. "We put out our disclosure that we did in the last quarter, and that’s what we’re doing," he said. "All the names and everything is on there." "We’re incredibly clear about the activities that we’re doing," he said. "What we’re doing is organizing publicly not any behind-the-scenes lobbying." OFA has registered as a lobbying organization in New York state on campaign finance issues, the Free Beacon first reported last month. Carson outlined the group’s strategy on an array of progressive policy issues, including immigration reform and climate change during the question and answer session. "No matter how well you think immigration is going right now, we are all going to have to work our hearts out to let the Republican Party know what we will do to them if they don’t get this law passed," he said. "And that is going to take a lot of hard work." Carson called climate change "an issue where, like gun violence, we just got to fundamentally change the politics and show that there’s going to be a price to pay for being a climate denier in this country." "We’ve got to show that we’re gonna make fun of people who won’t even accept science on an issue as important as this," added Carson, referring to a recent OFA video clip mocking Republicans as climate change "deniers." The Washington Post fact-checker blog gave the OFA climate change video "four Pinocchios," calling it "misleading." Carson also described the group’s plan for enrolling large numbers of people under Obama’s health care reform law. "We’ve got to get about 10 million people enrolled in health care this fall all across the country, and if New York City does its job and leads the way, we are going to get that done," said Carson. "We’re going to make Obamacare successful and we’re going to change so many people’s lives." Carson also defended the organization’s unsuccessful gun control effort. While he called the failure of gun control legislation in the Senate an "incredibly disappointing moment," he said he was encouraged by conversations with volunteers. "This is one of these moments, this is one these times in a fight like this where either we fold, and nothing happens for 20 years, or we prove there’s a price to pay for going the wrong way on an issue like this," Carson said. Carson touted the benefits of Organizing for Action’s nonprofit status, saying it is now able to partner with organizations like the Center for American Progress on content issues. CAP is a progressive policy organization that does not disclose its donors. 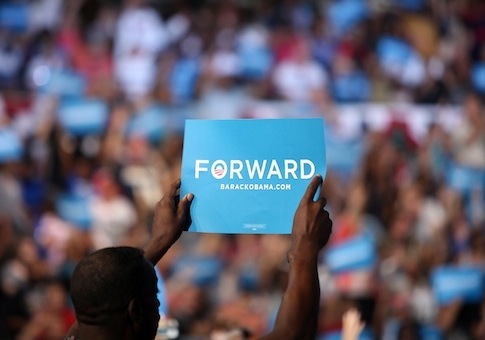 OFA pulled in a modest $4.8 million in its first quarter despite its aggressive fundraising effort. The group’s initial fundraising goal is $50 million. This entry was posted in Politics and tagged Democratic Donors, Jon Carson, Obama Campaign, OFA, Progressive Movement. Bookmark the permalink.